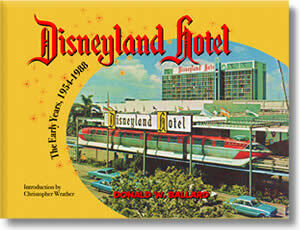 Since the book “Disneyland Hotel, the Early Years 1954-1988” was published in July of 2005, we have received an enormous amount of new information, photographs, documents, testimonials, brochures and other items detailing the rich history of the fabulous Disneyland Hotel. These new materials (which includes an amazing vault find with extremely rare and some not ever seen by the public photographs and films) will help better document the history of this landmark facility and fill in many of the gaps, dates and information regarding the Disneyland Hotel. This edition is devoted to the years 1954 to 1959 from the details surrounding the initial talks with Walt & Roy Disney and Jack Wrather to the many additions and expansions to the building of the Disneyland Hotel in its pre-Tower configuration. Filled with over 300 photographs and beautifully designed with 50’s period graphics and design. How do you build a hotel that, in its way, creates the same joy as Disneyland® – that sets the stage for a visit to the Magic Kingdom and sustains the happy mood when that visit is over? These are some of the problems which confronted Jack Wrather when he sat down with members of his staff to plan the official hotel at Disneyland®. The idea for the project was born when Mr. Wrather and Walt Disney got together for lunch one spring day in 1954. A year later, the Hotel came into being. A pacesetter in its field, the Disneyland® Hotel was designed with the family in mind – a special place where parents could relax and enjoy life with their children. So all rooms were built in spacious family size to accommodate four. An economical and efficient coffee shop with particular appeal for family groups was included in the complex of restaurants. And recreational facilities in abundance – Olympic size pool, wading pool, playground, miniature and three-par golf courses, 50-position driving range, shuffleboard, large screen television and others – were provided for parents and their youngsters. For even more excitement and convenience, the Monorail was extended to connect the Hotel with Disneyland®. A 1956 overhead with the North Garden Rooms and Administration Complex buildings near completion. The Hotel also sparked the family convention concept with a combination of fun and facilities found nowhere else. To its own outstanding attractions and those adjacent, the Hotel added well-equipped meeting rooms for groups of every size. Soon Dad was bringing Mother and the kids along, sure that they would find plenty to do while he got down to business. Adult tastes were further pampered when the Gourmet restaurants were built. Guests found that Gourmet filled the bill of fare admirably – and capped it with sparkling entertainment after dark in the Top of the Park and Around the World lounges. 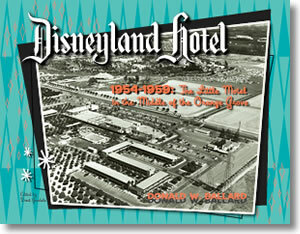 In short, what the Hotel set out to do in 1955 was to live up to the Disneyland® name: to provide each guest with a unique experience in pleasure. If you know someone who would enjoy this site, please let them know. Enter their e-mail below and click "Tell a friend". Also, check back to this site often because we will be adding much more information and fun stuff. * magicalhotel.com is not affiliated with Disneyland®, The Walt Disney Company or Disney Enterprises, Inc. Information contained within the site is as accurate as possible. All information is subject to change.